Item Number: 66-11-83 17235 Actual Weight: 0.3 lb. Box handler gloves are ideal for warehouse workers, drywallers, movers, or anytime a superior grip is needed. Super tacky Diamondclad™ palm and fingertips are silicone fused for extra grip on any smooth surface. Breathable and flexible for all day use. 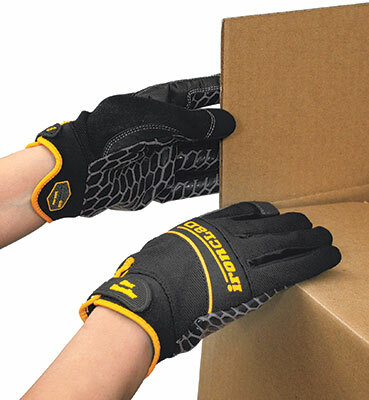 Machine washable gloves have reinforced low profile airprene to protect knuckles and a Snug Tug™ pull tab for wrist protection. Top of glove has a terry cloth sweat wipe.